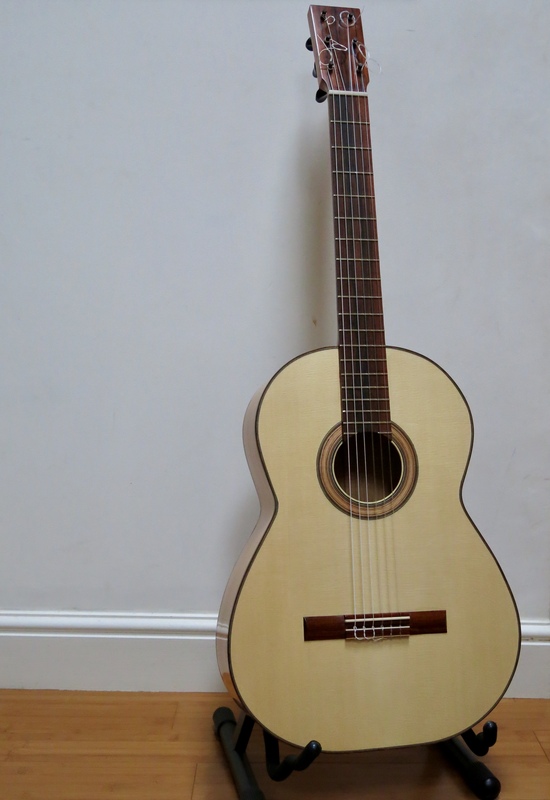 I recently finished making my second guitar, a ‘flamenco blanca’, or a traditional, lightweight, nylon-stringed guitar made from Cypress, Spruce and Cedar. It largely follows Courtnall’s 1950 Barbero plan, but with an eye on Courtnall’s 1933 Santos Hernandez plan and Brune’s 1951 Barbero plan, too. Studying the three plans offered a great deal of information about what makes a traditional flamenco guitar sound the way it does and the different design choices available to the maker. I also studied Gore and Gilet’s books for any references to flamenco guitar design and found their analysis of six vintage flamenco guitars to be extremely useful. It gave me a couple of key design goals: to build an instrument that weighs around 1100g and with air and top resonances within the ranges they identify. 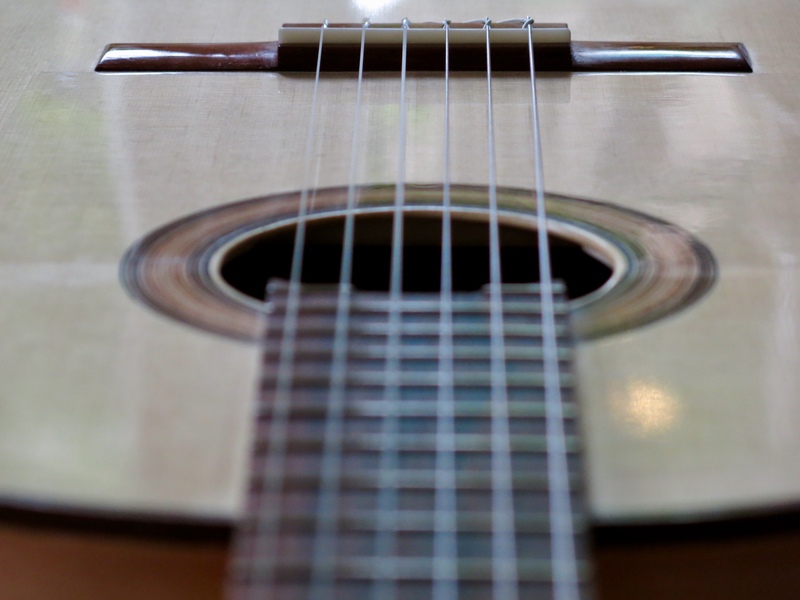 Based on their analysis of six vintage instruments, Gore and Gilet suggest that a good traditional sounding flamenco guitar will have an air resonance below 100Hz and a top resonance of around 180Hz (between F and F#) or around 190Hz (between F# and G). They suggest a bridge of no more than 15g, back and sides that are no thicker than 2mm and an overall weight of around 1100g. And here’s the finished instrument. The whole experience made me realise that although it was my second guitar, it was in fact the first guitar I was making on my own without direction and supervision from a teacher. In craft work like this, the experience of having to think for myself, face my own errors of judgement or execution and learn how to correct or live with my mistakes, was part of the process of learning, as well as a useful source of humility. Even with all of the detailed plans and scientific information at hand, I still had to rely on my own intuition and relatively inexperienced feel for the wood and tools. Fortunately, I’ve been asked to make the same guitar for someone else and so have the chance to improve on the same design. New directions in my research: How do luthiers learn their craft and teach their tradition? 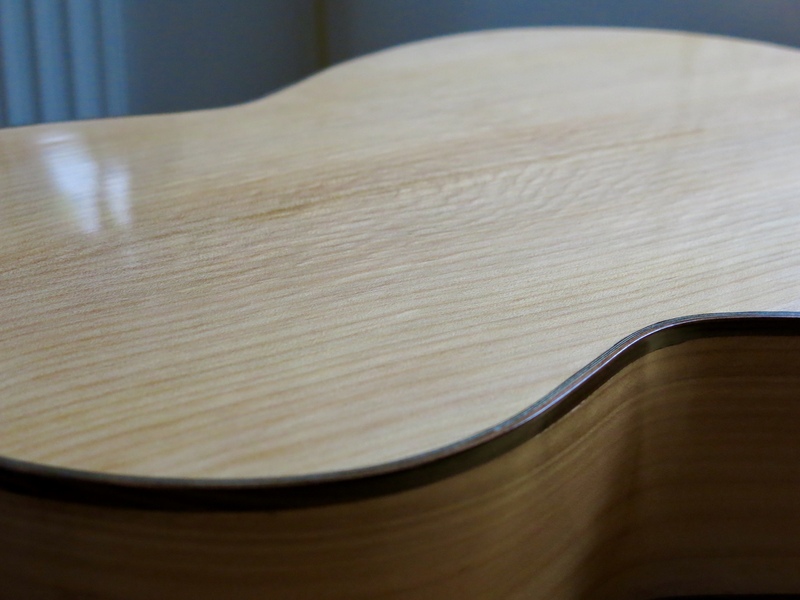 Over the past six months, I’ve been making a classical guitar. It’s been a really wonderful experience and perhaps the most satisfying educational experience of all, to have learned a complete process of making that results in an instrument that I can use and enjoy. 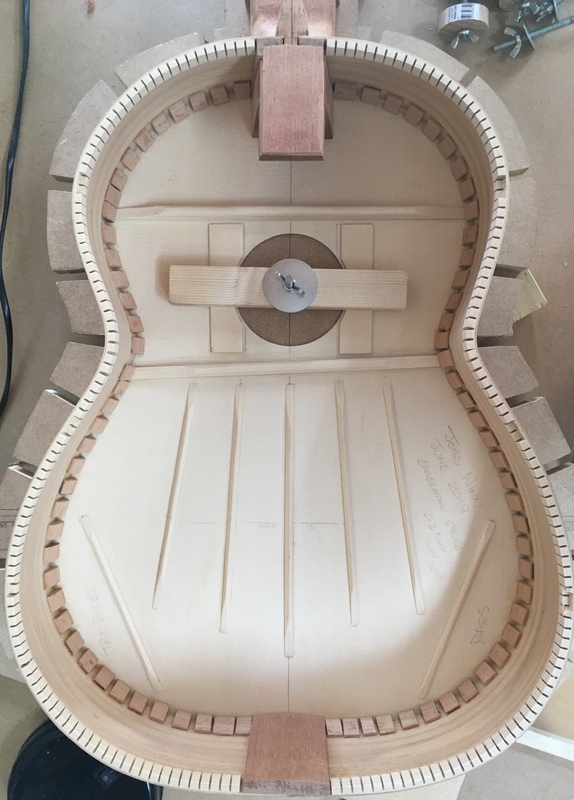 I’ve learned how to make a concert-level instrument, one-to-one with an experienced luthier, teacher and author of the established reference book on the subject, Making Master Guitars. A desire to ‘work with my hands’ has been a recurring impulse over the last decade or more but circumstances hadn’t been right until recently. 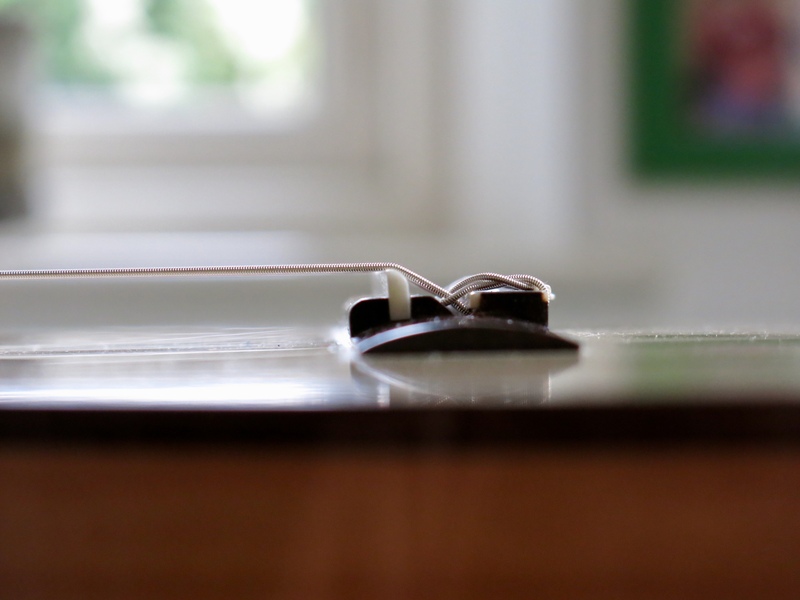 For the last two years, I have been receiving tuition from Rob Johns to learn how to play the classical guitar and earlier last year I began to notice a series of new instruments pass through my teacher’s studio. They were experiments in a new structural (internal) design of concert guitar that he and luthier, Roy Courtnall, were co-designing and I was privileged to be able to play them each week and discuss their musical attributes and craftsmanship with Rob during my lesson. 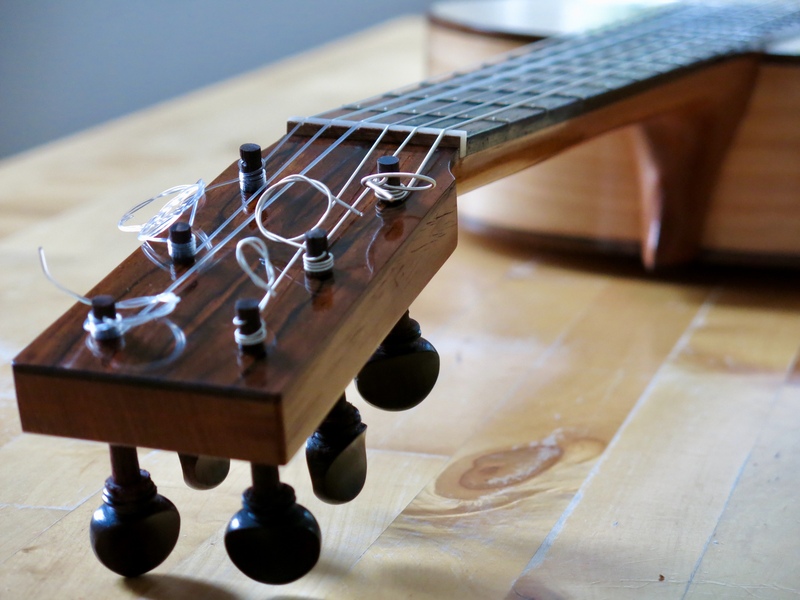 Then, one day in the Spring, it occurred to me that I had to make a guitar for myself – there was no question about it – I lived just minutes away from a highly regarded luthier/author/teacher whose guitars I’d been playing for several months. From that point on I started to make the arrangements and borrowed £5000 to pay for it all: tuition, tools, wood and a thorough clear-out and refurbishment of my garden shed workshop. From July, I visited Roy’s home and spent, on average, a day each weekend working in his workshop on my guitar. 26 days (over six months) later, it’s now finished and I’m planning my next one – this time on my own. I documented the process thoroughly the first time around, and with that experience and his book, I feel a mixture of excitement, apprehensiveness and sufficient confidence. 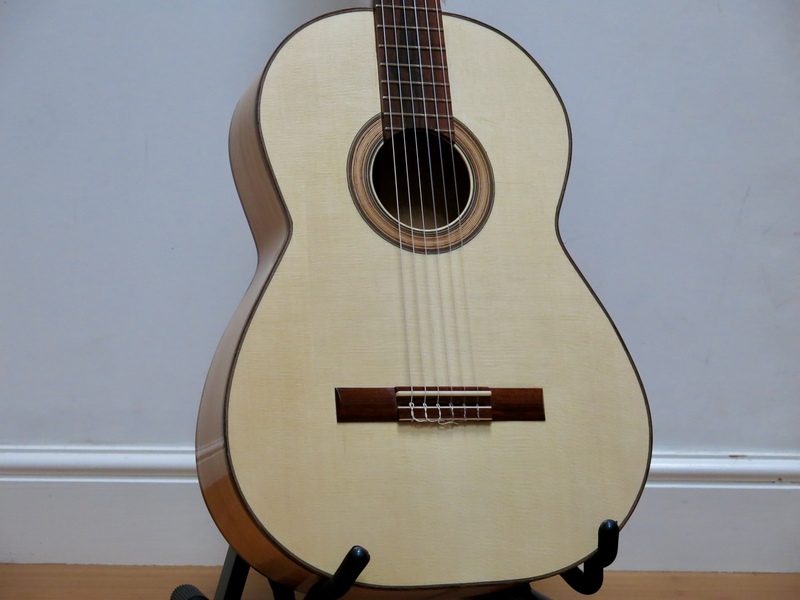 Apart from learning to make a guitar, I also learned from Roy something about the tradition of classical guitar-making in the UK; enough to make me want to find out more when I wasn’t in the workshop. Again, I found myself in a rather unique position, being taught one-to-one by a luthier who was the author of a standard reference book on the subject and who established the UK’s premier guitar-making course at Newark College, just a half-hour drive from where I live. Roy was an autodidact who had carefully researched and beautifully written a book for other autodidacts; he had established a formal, accredited programme of lutherie within an institutional setting, and was now teaching one-to-one in the style of a traditional apprenticeship. 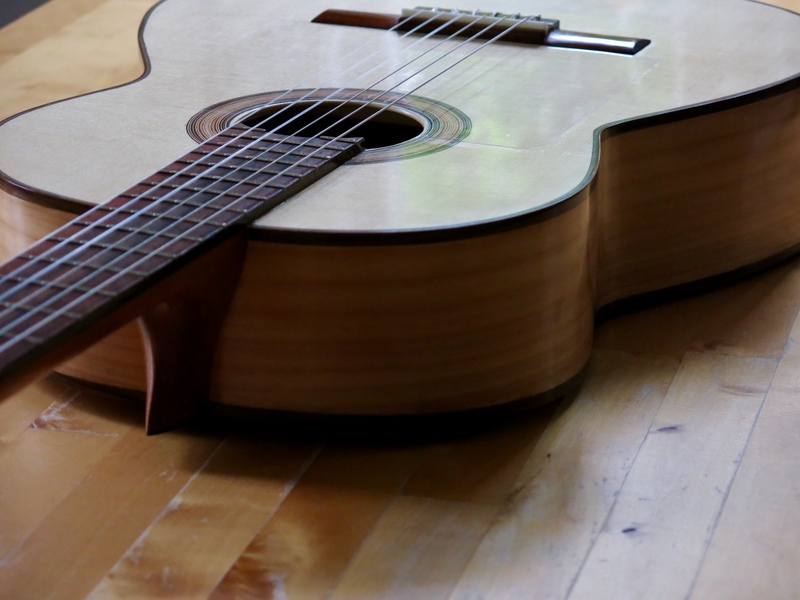 When I started to look around, I found that one or more of these three approaches were typical for all classical guitar-makers. Here’s a list of UK luthiers I have been compiling and a corresponding map I am plotting. college programmes, where cohorts of students learn as a group on accredited and non-accredited courses. This is interesting enough in itself, but then I was listening to the radio while in my refurbished workshop and there was a programme that discussed some recent research about ‘endangered crafts’. I wondered where lutherie stood on the list and found that it was deemed ‘currently viable’. That was a relief, but a number of issues relating to education and training have been identified as threatening the tradition. These include the difficulties of continuing training after completing a college course; college education only prepares individuals for further on-the-job training and self-directed learning. Securing such a position after college is difficult because it’s often not economical for experienced luthiers to take on apprentices/trainees; luthiers struggle to make a living and cannot afford to be spending time teaching someone as well as providing them with an income. Consequently, the traditional apprenticeship model is now very rare. Also, college courses are at risk because the numbers of students required to make them financially viable means that they are closing or accept too many students which, according to Radcliffe, has a detrimental effect on the quality of training. Reading more broadly, I learned that according to research by the Craft Council, since 2008 there has been a significant decline in the number of young people studying crafts at school and in further education; there are persistently low numbers of formal apprenticeships; there has been a rapid decline in the number of craft-based HE courses; and there has been an increase in BAME students and non-UK domiciled students studying craft in HE. 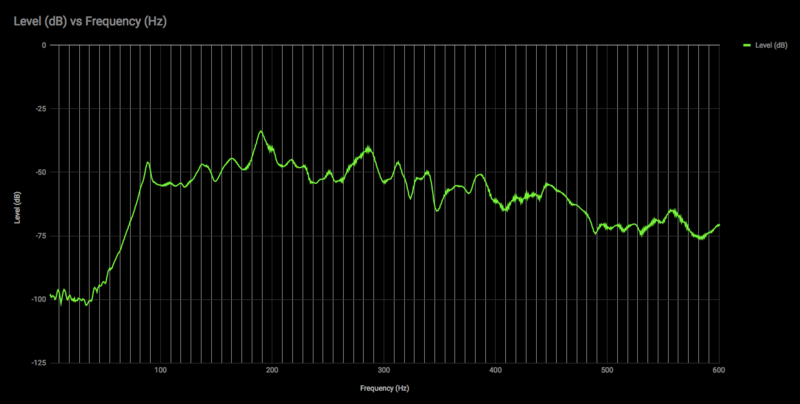 So, I am embarking on a relatively new area of research for me. Of course, there are some, mainly conceptual, continuities with the work I have been doing on ‘Student as Producer’ and the pedagogic relationship; craft approaches to technology in higher education; non-alienating forms of work and ownership of the means of production. My work on co-operative higher education will continue, but as part of the Co-operative University Forum and Co-operative Higher Education Network. In terms of my new focus, there is a range of related literature but no academic study of the teaching and learning (i.e. development and transmission of the tradition) of lutherie in the UK has been undertaken. I am interested in the history, but also very much on the different contemporary modes of lutherie education, the variety of pedagogical models, syllabi and institutional and non-institutional environments where the teaching and learning takes place. 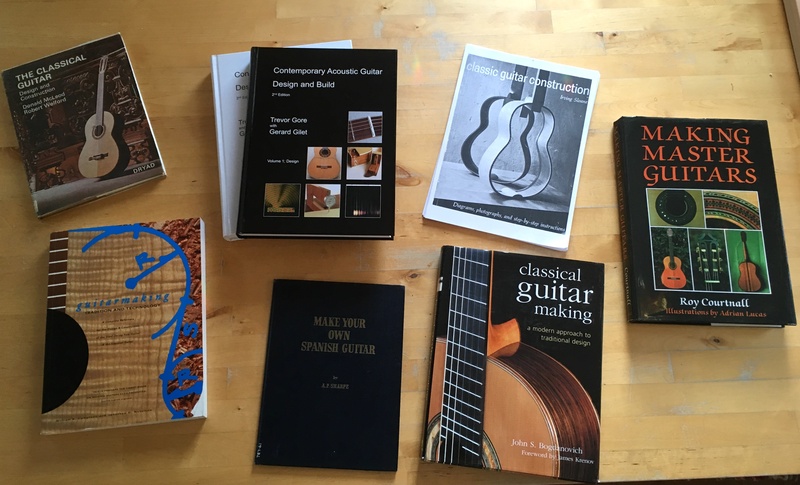 A variety of classical guitar making books for the autodidact. How has the experience, knowledge and skills (i.e. craft) of classical guitar-making in the UK been transmitted since the early 20th century? Can a ‘genealogy’ of luthiers be established? What has been the role of colleges/institutions in the education and training of aspiring luthiers? What are the current risks and challenges that such institutions face? What is the contemporary experience of lutherie students on formal programmes of study? Who are they? How are they taught? What are their motivations and aspirations? What challenges do they face after graduation? What role has autodidacticism (i.e. self-taught luthiers) played in the development and maintenance of the tradition of classical guitar-making? What can we learn about the experiences of autodidacts and the literature (e.g. books, magazines, internet forums) that they draw upon to teach themselves. 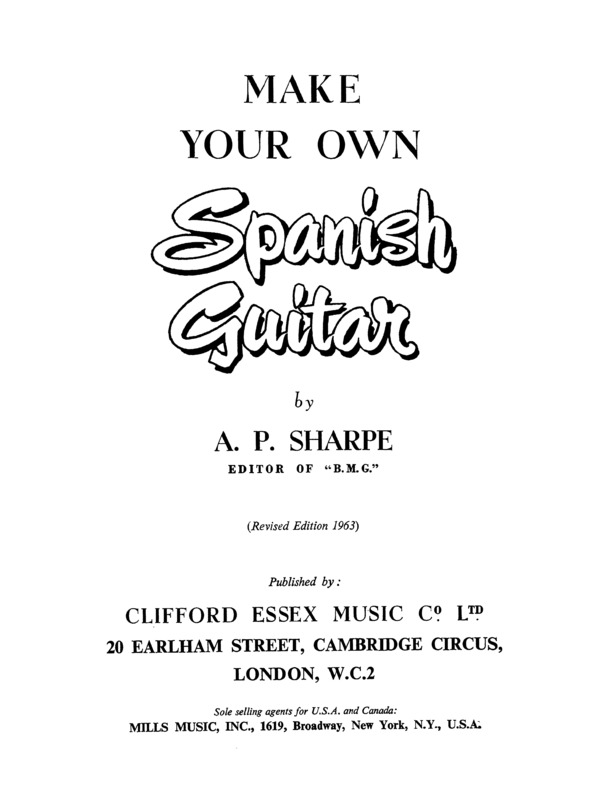 A. P. Sharpe (1957) The earliest English-language book for making classical/Spanish guitars. 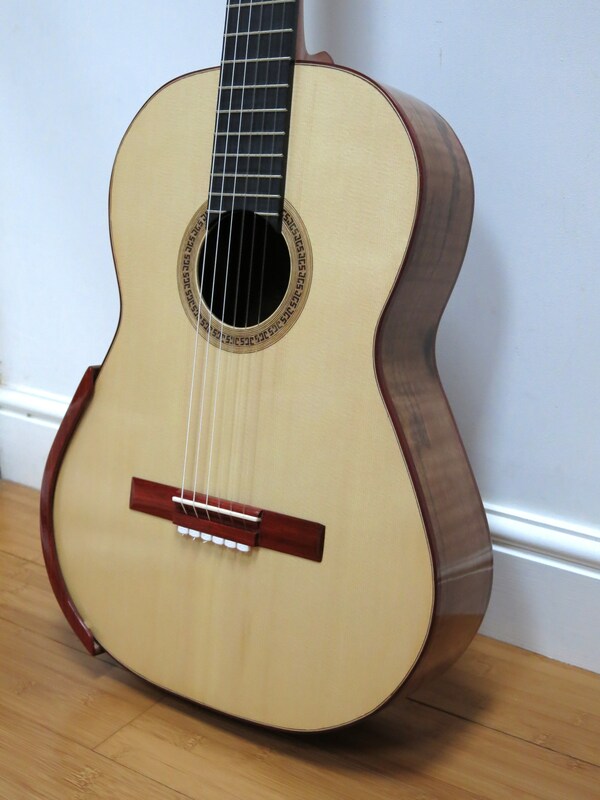 Clearly it will require a study of historical data and literature (archives, books and trade magazines) to understand the 20th century history of UK classical guitar making, how the knowledge and skills of the craft has been transmitted, the role of institutions, and who the significant teachers have been up to the present day and the reasons for their significance. The historical research will inform biographical research of luthiers who are still working or living, with an emphasis on how and from whom they learned, who they may have taught, and further issues relating to the teaching, learning and transmission of the craft. A third part of the research will be a case study of the guitar-making course at Newark College. The aim here is to understand the nature of teaching and learning in this setting, the design and content of syllabi, and the issues and challenges of lutherie education in an institutional setting. Well, that’s the initial plan. While you’re here, why not watch a fascinating film of José Romanillos, one of the most important luthiers of the 20th century, making a guitar in Wiltshire in 1980. He taught himself with a 32 page book by A. P. Sharpe, published in 1957, which is very modest by comparison with more recent texts, to say the least. Update: I am maintaining a bibliography here. Author Joss WinnPosted on February 21, 2018 October 18, 2018 Categories BlogTags guitar, lutherie, research1 Comment on New directions in my research: How do luthiers learn their craft and teach their tradition? I am new to guitar making (I play a bit) and am being taught one-to-one by Roy Courtnall, author of Making Master Guitars. I expect it to take 20-30 days in total and have so far spent just four days with Roy. My time permits only one or two days a week working with Roy so it won’t be finished until early next year. 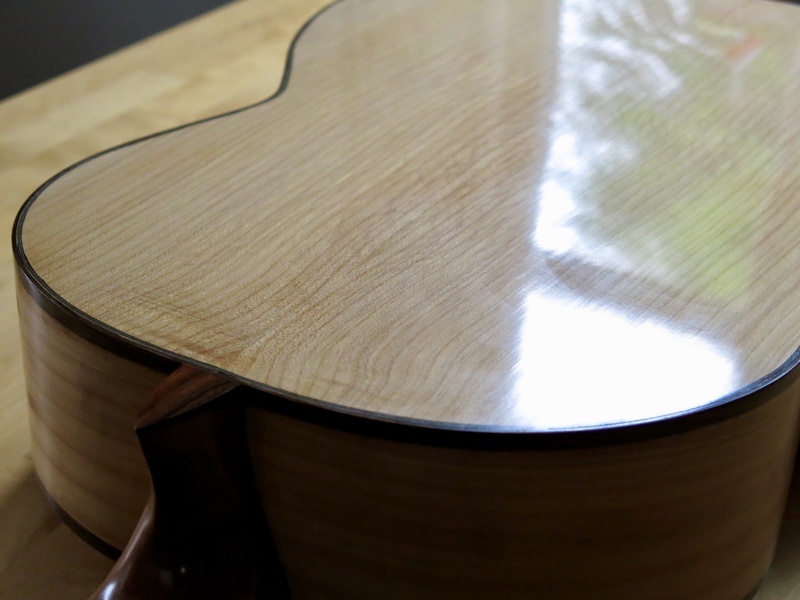 It will be walnut back and sides, cedar neck and a lattice spruce top. Needless to say, it’s a fantastic experience and education and I am documenting it as a reminder of my learning; what to remember, look out for, and to do when I come to build a guitar on my own. I intend to publish a separate blog of all the photos (there will be hundreds!) with descriptions and cross-references to his book when the guitar is complete. Click on the image below to see some highlights or follow this forum thread where I post updates at the end of each day.